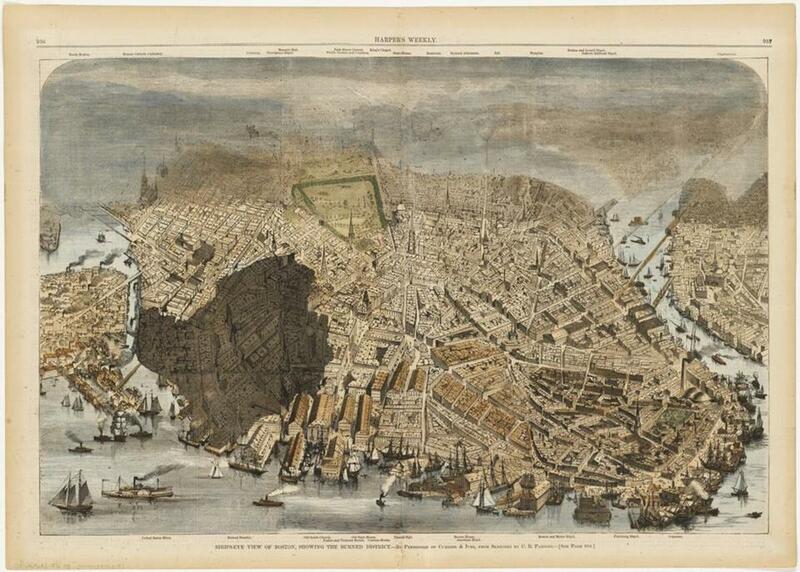 Currier & Ives, “Bird’s-eye view of Boston, showing the burned district,” 1872. The first thing a viewer sees in “Breathing Room: Mapping Boston’s Green Spaces” is also the first thing a viewer steps on. An enlarged version of Henry McIntyre’s 1852 map of the city has been superimposed on the floor. That’s as it should be, since the show is about the (unenclosed) ground beneath our feet. What stands out about the map — even more than its handsomeness and detailing — is how much the city has changed (hey, where’s Back Bay? how come the Charles basin is so wide?) and how relatively little green there is. Boston Common, the Public Garden, some cemeteries: That was about it back then. “Breathing Room,” which runs at the Leventhal Map & Education Center at the Boston Public Library through Sept. 30, shows how — and how much — that came to change. The show includes diagrams, artist’s renderings, photographs, and, mostly, maps. The earliest one was executed by a British military engineer, in 1775. The only open space of interest to him, presumably, was fields of fire. The most recent are from 2017: “Existing Open Space,” from the Imagine Boston 2030 project, and another, of the Rose Kennedy Greenway. That one comes with a couple of photographs, too. That span covers a lot of time, though not so much space. That’s true even if one moves beyond the city limits. “Breathing Room” (an excellent title) includes maps of Lynn Woods, the Middlesex Fells, and Blue Hills Reservation. This makes sense. Boundaries are anathema to open space. It also makes sense because Boston is so compact, the smallest major US city, after San Francisco and Washington. Not to place it in a metropolitan context is to misrepresent it. Urban open spaces often blend utility and health with recreation. So “Breathing Room” includes not just parks but also cemeteries (Mount Auburn Cemetery in Cambridge, and Forest Hills Cemetery), parkways, an 1892 “Gentlemen’s Driving Map Showing the Park System of Boston” (driving as in carriages), a map of impressively extensive bicycle routes from 1898, and, truly combining utility and health with recreation, reservoirs. Chestnut Hill Reservoir is an example of how green spaces can change over time: It initially had two basins, not one. When the Charles River Esplanade opened, in 1910, it was called the Boston Embankment. The embankment was, in part, the result of the building of the Charles River Dam. The absence of the dam is why the basin is so big in that 1852 map. (Where was Back Bay? It was still an actual bay.) Wood Island Park, a Frederick Law Olmsted design in East Boston, disappeared when Logan Airport was built. Olmsted’s is the great name in the history of Boston open space, its master builder. Hired in 1878, he created what must qualify as Boston’s single finest civic feature: the Emerald Necklace. It stretches for seven verdant miles from the Common and Public Garden, via the Commonwealth Avenue Mall and the Fens, the Riverway, Olmsted Park, Jamaica Pond, the Jamaicaway, and the Arborway on to Arnold Arboretum and Franklin Park. It was the first integrated system of public parks in the United States. 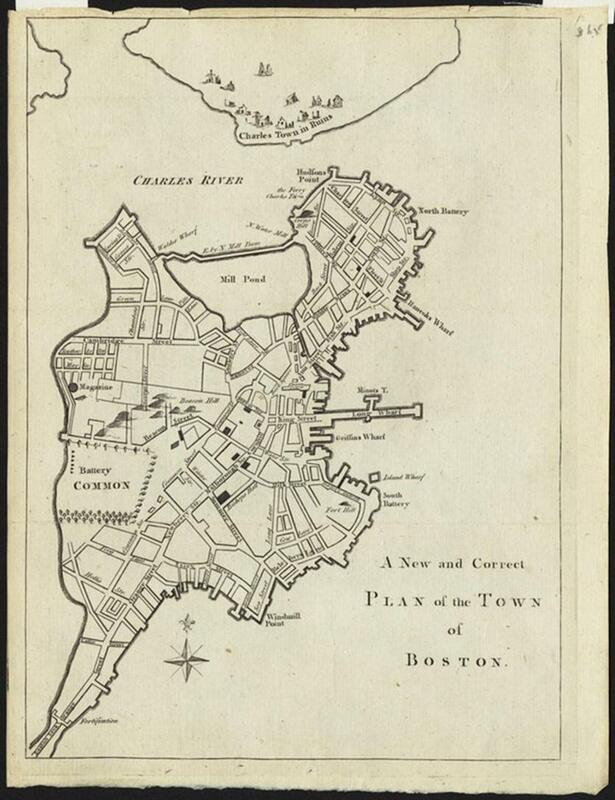 Thomas Hyde Page’s “A New and Correct Plan of the Town of Boston,” 1775. A wall label says that there are plans to turn Columbia Road into a greenway, as Olmsted originally envisioned. He called the link the Dorchesterway. It would connect Franklin Park with what is now Moakley Park in South Boston, at last completing the necklace. Not all of the show offers such happy views. An 1866 map charts an 1849 cholera outbreak — a reminder that urban green space is less luxury than matter of public health. Currier & Ives’s “Bird’s-eye view of Boston, showing the burned district” was inspired by the Great Fire of 1872. The conflagration consumed 60 acres, destroyed 772 buildings, and killed 13. It’s a miracle there were so few deaths. The map ran in Harper’s Weekly just three weeks after the fire. For 19th-century media, that was practically in real time. The stark smudge of brown at the bottom, showing the extent of the destruction, practically jumps off the map. What doesn’t jump out of the show — it’s nicely tucked in — is a small display on Post Office Square, that excellent 1.7 acres of greenery downtown that used to be a particularly unsightly parking garage. Instrumental in getting the garage placed below ground was the late real estate developer Norman B. Leventhal. The park is named for him. 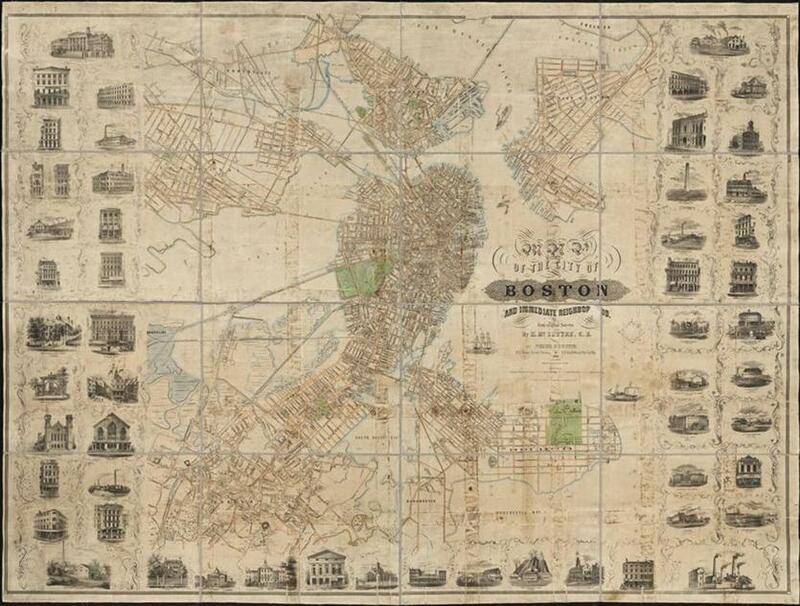 He’s also the Leventhal in Leventhal Map & Education Center at the Boston Public Library. The only thing better than a well-deserved pat on the back is when it’s understated.